You cannot touch music but you feel it when your heart is open to it. There are many different styles of music. When you are young, you respond by instinct. Maturity however, brings with it the ability to understand one or more of the myriad genres, and the need for maturity is fulfilled when you start to feel the message that the music wishes to reveal to us. Music tells us the stories that we need to hear in any given time. Music makes our lives richer, more meaningful and more substantial. All European Audio Team high performance products have been designed to bring us as close as possible to the meaning and spirit of the original composition and performance. We become a part of the performance. Music transcends the boundaries of language and culture. It is communication with one's soul. We invite you to experience the delights and revelations of music through components created by those who love music as much as you do..
E-Flat's mission is to bring to the music lover the highest quality performance, but in a user-friendly design. Ultra-flat, ultra-light and ultra-rigid, the E-Flat tonearm measures 10in long. A unipivot bearing supports the E-Flat, it's fully (and easily) adjustable counterweight decoupled by energy- and vibration-absorbing Sorbothane. The E-Flat's unipivot system is extremely precise and accurately balanced, thanks to components endowed with especially hard metal surfaces. Unwanted motion often attributed to lesser unipivot designs is eliminated by the high mass of unipivot housing and the added security of two metal guides. A further valuable benefit is that its carbon-fibre arm tube can be changed by the user to address to specific cartridge requirements, with either lighter or heavier tubes to establish different arm/cartridge resonant frequencies. Adjustable anti-skating and a damped cueing lever are also fitted. A flat arm tube opens up a number of possibilities for the designer and the listener. Its shape encourages the design of a flatter platter with easier, visible arm levelling, and there is no taper to accommodate. With perfect integration to the unipivot design pillar, no hollow tube to suffer the inevitable echo effects or ringing, greater stiffness, a new and superior hanging counterweight design with very high damping properties, the E-Flat tonearm's performance is truly quiet and incredibly fast. 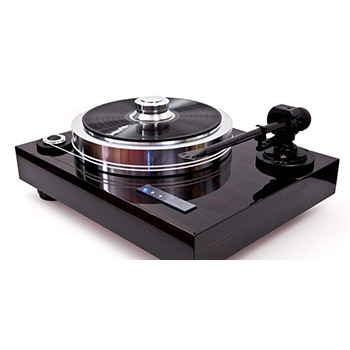 The platter incorporates from the inner side sorbothane damping and from the outer side black damping matt produced from the recycled vinyl that make platter completely quiet. Terrific inverted bearing construction with ceramic ball on the top faces to the Teflon. The pressure on the ceramic ball is reduced by two enormous neodymium magnets that are holding the platter and take over most of the load from the heavy platter. The big brother Forte has built in two motors in separate chassis that makes its imposing 70 cm width. EAT Forte S is "only" 55cm width and single-piece construction. It has also two AC motors but they are built symmetric on the right side besides of the platter, therefore you do not need two belts with different length as by big EAT Forte. Operating of the motor by display panel was getting simpler into the 3 main keys: 33.3, 45 and on/off button. 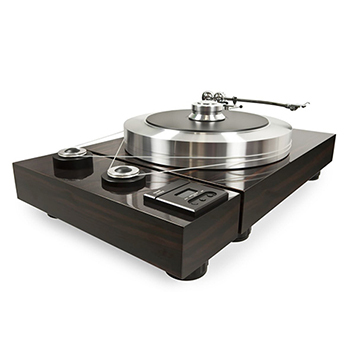 Separate Sub Chassis and a mass loaded turntable This gives us the best of both worlds. The chassis of the table is very heavy and mass-loaded using metal-fi lled sand. The feet are magnetic and act as a sub chassis to support the table. The platter consists of two parts. The first part uses a soft alloy, the second part, a harder one. This reduces energy flow. The first part also incorporates the neodymium magnets. The platter weighs more than 20 kg (44 lbs). The diameter of the platter is 400 mm (15.75 1/2) (not the usual 300 mm [11.8 1/2]). Kinetic energy stored in such big platter turning at 33 RPM is an incredible 2460 Joules! This means that with the same weight you gain more moving mass on the platter. The platter also incorporates sorbothane damping to make it resonance free. The vinyl matt is made from recycled vinyl records crating a perfect interface for the record. A clamp holds the record on the vinyl matt. The bearing is not standard but inverted with an oversized polished shaft. A ceramic ball is used on the top because it is very hard and inert. This, in combination with a Teflon plate as a bearing mirror, is also a good damping device. Teflon's accurate satin surface produces perfectly smooth movement without any rumble. The platter has a magnetic suspension using neodymium magnets. By increasing the distance from the bearing to the cartridge, the small neodymium magnets eliminate magnetic infl uence on the cartridge. Due to the magnets we can still move a large mass allowing the bearing to see virtually no pressure. This avoids rumble. (A mass loaded platter usually causes high levels of rumble.) The pressure of the bearing is adjustable. There are existing different philosophies about bearing pressure. 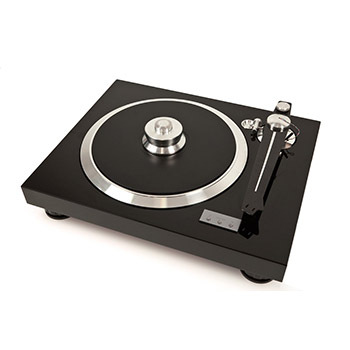 With the Forte turntable you can adjust it according your preferences and taste.